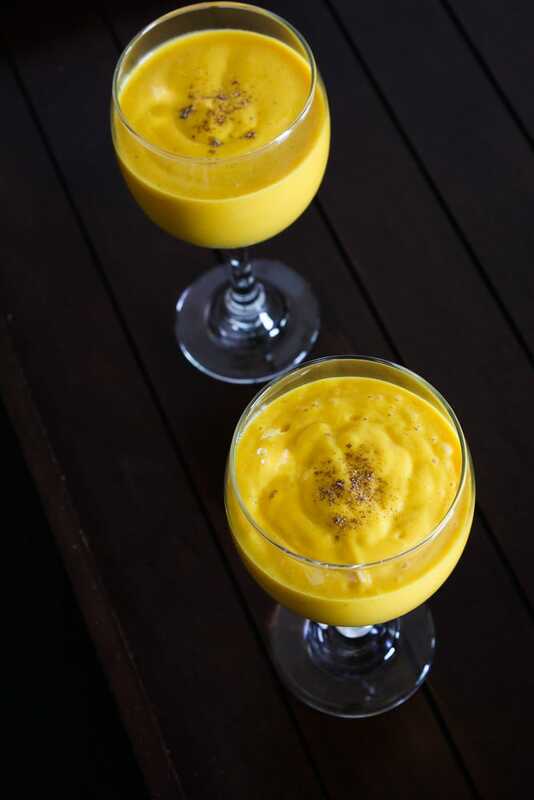 This thick, creamy, delicious Indian mango lassi will quickly become your new go to. 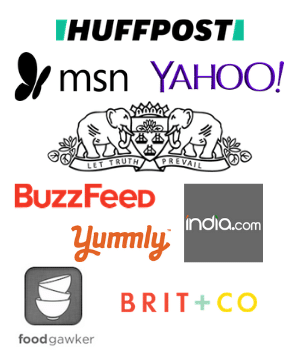 So from now on, you will not miss your Indian restaurant favorite. Because you can make mango lassi recipe at home very easily and quickly. Mango lassi is a refreshing, cooling beverage made from sweet, ripe mangoes, yogurt, and sugar. It is flavored with cardamom powder and sometimes with rose water. This is the perfect beverage to beat the summer heat. So basically lassi is the beverage and has yogurt as the main base ingredient. In India, it usually gets really hot during the summer season. If you are staying out for long time under the sun, you might hit with the heat stroke (aka lu lagna). To beat this kind of heat stroke, yogurt and other cooling ingredients (like cucumber, mint) help a lot. So, most of the Indians consume yogurt everyday during the summer season. It can be in beverage form (lassi, chaas) or it can be raita or kadhi. Yes, you can use frozen mangoes to make mango lassi. But I prefer the fresh ones because fresh, ripe mangoes give natural sweetness and deep yellow color. Can I use canned mango pulp? Yes, you can use canned mango pulp to make mango lassi. The canned pulp is already sweet, so you may want to reduce the sugar in the recipe. I do not prefer the canned product because I don’t use processed food in my kitchen. Can I freeze the leftover mango lassi? Yes, absolutely. This is the best decision you have ever made. Freeze them in the Popsicle molds and you will have mango yogurt popsicles to enjoy. Why the color of my lassi is not same as yours? The color of the lassi is purely depended on the verity of mango you used. If using canned mango pulp then you will get a brighter color than mine. Just so you know, I have used really ripe Ataulfo mangoes (aka Champagne mangoes). All the ingredients have to be chilled. If not then make mango lassi ahead of time and chill in the refrigerator. It tastes best when served chilled. The addition of rose water is optional here. But I do recommend it because it gives fresh, refreshing flavor. To get extra creamy, thick mango lassi, use the Greek yogurt. Take chopped mangoes and sugar in a blender. Adjust the sugar quantity as per the sweetness of the mangoes. Blend it till you get a smooth puree. Again blend it well till everything is incorporated well. Pour into serving glasses. If not serving right away then keep in the refrigerator. It tastes best when served chilled. Lastly, you can garnish with cardamom powder or mint leaves. 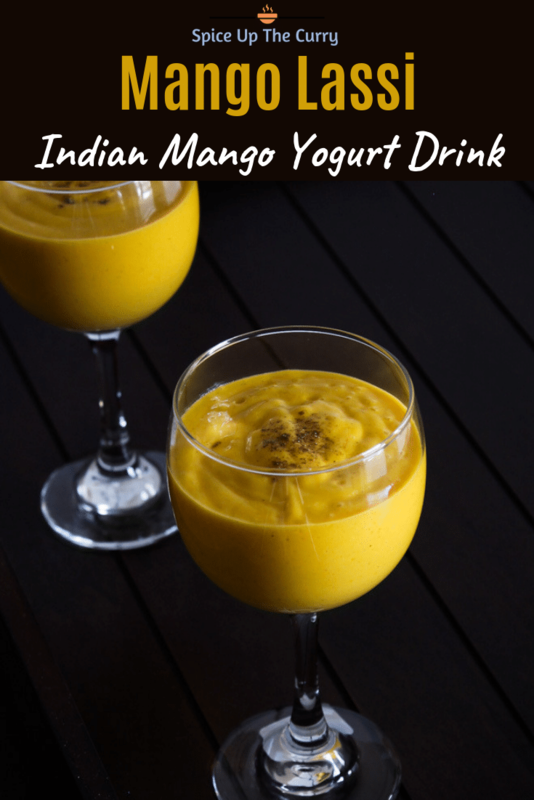 Make this quick, easy, Indian restaurant favorite mango lassi at home and enjoy!! 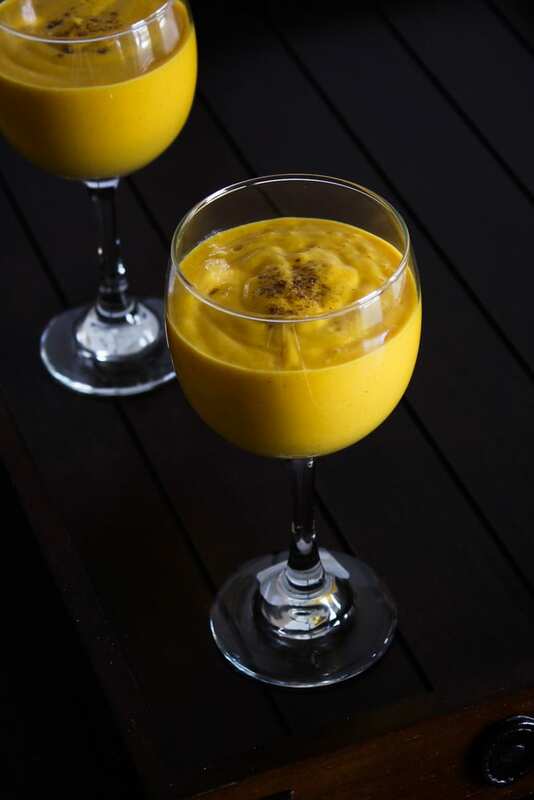 Mango Lassi Recipe – a chilled mango yogurt beverage to beat the summer heat. Take chopped mangoes and sugar in a blender. Adjust the sugar quantity as per the sweetness of the mangoes. Blend it till you get smooth puree. After long time I have seen Mumbai street food.recipes like sev puris are fabulous.